Choate alumni college athletes had some incredible accomplishments this fall. Caitlin Farrell '15, Sydney Jones '17, Yasmine Reece '15, Christine Etzel '15, Omar John '17, and Charles Bellemare '17, William Harris '15, and Abu Daramy '16 have had an outstanding fall season at the collegiate level, all receiving national recognition. Caitlin Farrell '15, senior forward for the Georgetown University Soccer team, was selected as one of three MAC Hermann Trophy Finalists, an award which is considered "most coveted individual honor in NCAA Division I soccer." This award is given annually to the top male and female players in the country. Caitlin is the first ever female in Georgetown history to be named as a finalist and the second in Georgetown history. The winner will be announced on January 4, 2019 at the historic Missouri Athletic Club in St. Louis. In addition to this honor she has been named to the BIG EAST All-Tournament Team while earning Most Outstanding Offensive Player of the tournament, and was also named to the United Soccer Coaches Scholar All-South Regional First Team and First Team All-American. The women's Hoya soccer team came up short in the National Championship game losing after two overtimes to UNC. Sydney Jones '17 had a successful fall season with the Williams College women's soccer team, she was the Eph's leading scorer with 22 points in 21 games and of her ten goals this past season eight of them have been game winners. Sydney has been named to the Third Team Division III All-American Team and the First Team All-New England Team by the United Soccer Coaches Association. 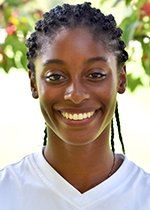 Yasmine Reece '15, senior on the Wellesley College women's volleyball team, was selected and participated in the NCAA Division III New England women's volleyball NEWVA Senior Classic All Star Game and Skills competition. This fall Yasmine was a AVCA Honorable Mention All-America and All-Region selection as well as being named to the NEWVA All-Region First Team. Christine Etzel '15, senior goalkeeper for the Brown Bears, earned New England Intercollegiate Women's Soccer Association All-New England honors this season. She finished her Brown soccer career ranked second all-time at Brown in goals-against average and tied for second in shutouts. She was also selected this fall as a Senior CLASS Award Candidate and served as a team captain for the NEWISA Senior Bowl. Omar John '17 and Charles Bellemare '17, both a part of the Boston College club water polo team, came in ninth place at the Men's National Collegiate Club Championship this fall at University of Arizona. They lost to University of California Berkeley but had wins against Florida, Virginia Tech, and Villanova. William Harris '15 a senior defensive back for the Boston College Eagles had an outstanding fall, he served as team captain and was elected to the Senior Bowl. Abu Daramy-Swaray '16 a junior on the Colgate University football team was selected to the All-Patriot League 1st Team and reached the NCAA Division I Football Championship quarterfinals where he recorded an interception. Congratulations to all our Choate alumni for their numerous accomplishments in their collegiate athletic careers!